iOS requires you to enable 'NFC Tag Reading' for your App ID here. So replace com.tns.NativeScriptActivity with com.tns.NativeScriptNfcActivity. Want to dive in quickly? Check out the demo! You can run the demo app from the root of the project by typing npm run demo.ios.device or npm run demo.android. This is what it looks like in action on iOS! If you're using Webpack to bundle your app you'll need to add 1 line of configuration in case you're targeting Android. Open webpack.config.js (it's in the root of your project). Look for an Array named appComponents, which likely contains stuff like "tns-core-modules/ui/frame". Add resolve(__dirname, "node_modules/nativescript-nfc/nfc-activity.android.js") as shown here. A device may have an NFC chip, but it needs to be turned on âœ… in order to be available for this plugin. So if available returns true and enabled returns false you should prompt the user to turn NFC on in the device settings. You may want to get notified when an Ndef tag was discovered. You can pass in a callback function that gets invoked when that is the case. 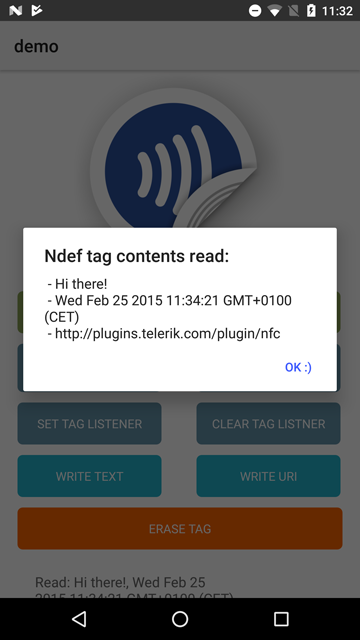 Note that blank/erased NFC tags are not returned here, but through setOnTagDiscoveredListener instead. See the definition of NfcNdefData to learn what is returned to the callback function. stopAfterFirstRead: boolean (default false): don't continue scanning after a tag was read. scanHint: string (default undefined): Show a little hint in the scan UI. scanHint: "Scan a tag, baby!" You can pass in null instead of a callback function if you want to remove the listener. You may want to get notified when an NFC tag was discovered. You can pass in a callback function that gets invoked when that is the case. Note that Ndef tags (which you may have previously written data to) are not returned here, but through setOnNdefDiscoveredListener instead. See the definition of NfcTagData to learn what is returned to the callback function. You can write to a tag as well with this plugin. At the moment you can write either plain text or a Uri. The latter will launch the browser on an Android device if the tag is scanned (unless an app handling Ndef tags itself is active at that moment, like an app with this plugin - so just close the app to test this feature). And finally, you can erase all content from a tag if you like. You first need to "discover" it with setOnTagDiscoveredListener (see below). While you're still "near" the tag you can call writeTag. Same as above, but discovery is done through setOnNdefDiscoveredListener. Peer to peer communication between two NFC-enabled devices. Support for writing other types in addition to 'text' and 'uri'.